As one of Melbourne’s premier event venues, Ellis Street Studio knows how to put on a corporate function that will wow your guests. Whether it be a stylish, sophisticated soiree, designed to impress staff, stakeholders or partners, an elegant luncheon to say thanks to your clients or an informative conference to unveil a new concept, allow our team to show you why Ellis Street Studio is the perfect commercial event hire venue. 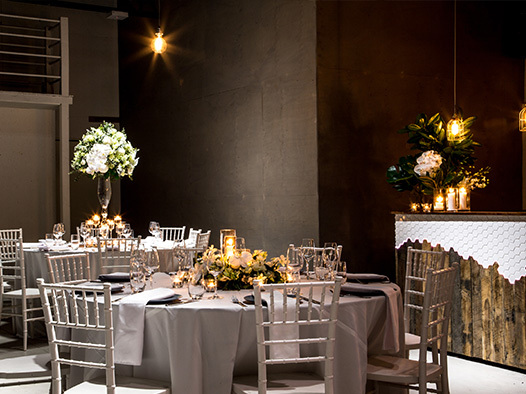 Located in the heart of stylish South Yarra/Prahran, Ellis Street Studio is adorned with a grand design that is sure to impress any guests you have at your corporate event. Elegant, contemporary design, ambient lighting and stylish, polished concrete floors are all part of our lavish interior, making it a venue that is perfect for any style of corporate event. One of the most vital aspects of hosting a corporate event is to make a good impression. Therefore, why not ensure that this is done by hosting your function at Melbourne’s premier commercial event hire venue, Ellis Street Studio? We have a range of features which make our centre one of the most revered in the South Yarra area, and our specially selected team of hosts, wait staff and bar staff are on hand to ensure that your corporate event is one that reflects the big plans you have for the future. If you are interested in enquiring about hosting your next corporate event at Ellis Street Studio, or would like to make a booking for your function, please don’t hesitate to get in contact with our friendly and helpful team of staff. Please call 03 8579 0951 or send us a message using the form below. We will get back to you as soon as possible and with all the information you require.